Advance Tabco Cabinet Base Work Table CB-SS-3012M. 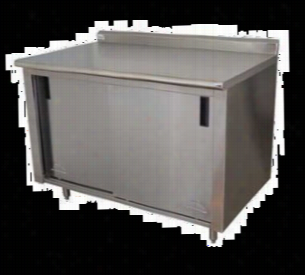 Work Table, cabinet base with sliding doors, 30" wide, 14 gauge 304 series stainless steel top, without splash, 144" long, stainless steel bullet feet, with midshelfThis unit is made to order, and cannot be cancelled once in production at the factory. Please inform us as soon as possible if you are thinking about cancelling your order. Traulsen Mobile Holding Cabinet AHF132WP-HHG. 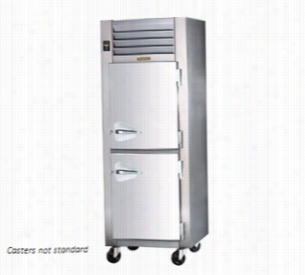 The Traulsen, AHF132WP-HHG is perfect in keeping bread, pizza and meals warm for any bakery or hotel.Â The Traulsen heated Cabinet is a one section half height glass door with pass thru for easy access on both sides.Â The exterior of the AHF132WP-HHG is stainless steel with an aluminum interior.Â This cabinet comes with three chrome plated adjustable shelves and the pilasters are installed at the factory.Â This Traulsen warmer comes with 6" adjustable stainless steel legs, casters are an option if needed.This AHF132WP-HHG is a 208 voltage, single phase warmer cabinet.Â The 9' cord and plug are attched.Please refer to the specification sheet for additional information. Advance Tabco Cabinet Base Work Table CB-SS-3612. Work Table, Cabinet base with sliding doors, 36" wide, 14 gauge 304 series stainless steel top, without splash, 144" long, stainless steel bullet feetThis unit is made to order, and cannot be cancelled once in production at the factory. Please inform us as soon as possible if you are thinking about cancelling your order. Traulsen Mobile Holding Cabinet AHF132WP-FHG. 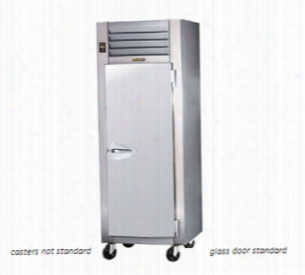 The Traulsen, AHF132WP-FHG is perfect in keeping bread, pizza and meals warm for any bakery or hotel.Â The Traulsen heated Cabinet is a one section full height glass door with pass thru for easy access on both sides.Â The exterior of the AHF132WP-FHG is stainless steel with an aluminum interior.Â This cabinet comes with three chrome plated adjustable shelves and the pilasters are installed at the factory.Â This Traulsen warmer comes with 6" adjustable stainless steel legs, casters are an option if needed.This AHF132WP-FHG is a 208 voltage, single phase warmer cabinet.Â The 9' cord and plug are attched.Please refer to the specification sheet for additional information. Advance Tabco Cabinet Base Work Table CK-SS-369M. 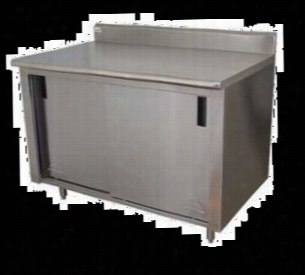 Work Table, cabinet base with sliding doors, 36" wide, 14 gauge 304 series stainless steel top, 5" backsplash, 108" long, stainless steel bullet feet, with midshelf.This unit is made to order, and cannot be cancelled once in production at the factory. Please inform us as soon as possible if you are thinking about cancelling your order. Advance Tabco Cabinet Base Work Table CB-SS-3012. Work Table, Cabinet base with sliding doors, 30" wide, 14 gauge 304 series stainless steel top, without splash, 144" long, stainless steel bullet feetThis unit is made to order, and cannot be cancelled once in production at the factory. Please inform us as soon as possible if you are thinking about cancelling your order. Advance Tabco Cabinet Base Work Table CF-SS-2412M. Work Table, cabinet base with sliding doors, 24" wide, 14 gauge 304 series stainless steel top with 1-1/2" turned up edge at rear, 144" long, stainless steel bullet feet, with midshelfThis unit is made to order, and cannot be cancelled once in production at the factory. Please inform us as soon as possible if you are thinking about cancelling your order. Advance Tabco Cabinet Base Work Table CB-SS-369M. Work Table, cabinet base with sliding doors, 36" wide, 14 gauge 304 series stainless steel top, without splash, 108" long, stainless steel bullet feet, with midshelfThis unit is made to order, and cannot be cancelled once in production at the factory. Please inform us as soon as possible if you are thinking about cancelling your order. Advance Tabco Cabinet Base Work Table CB-SS-3010M. Work Table, cabinet base with sliding doors, 30" wide, 14 gauge 304 series stainless steel top, without splash, 120" long, stainless steel bullet feet, with midshelfThis unit is made to order, and cannot be cancelled once in production at the factory. Please inform us as soon as possible if you are thinking about cancelling your order. Advance Tabco Cabinet Base Work Table CK-SS-3612M. Work Table, Cabinet base with sliding doors, 36" wide, 14 gauge 304 series stainless steel top, 5" backsplash, 144" long, stainless steel bullet feet, with midshelfThis unit is made to order, and cannot be cancelled once in production at the factory. Please inform us as soon as possible if you are thinking about cancelling your order.